It was almost 2 years ago when I put a request out on Twitter, I wanted to start a podcast, I just didn’t want to be in charge of producing it each week. To me, that seemed like the hard part. I just wanted to pop in, record the episode and let somebody else worry about the technical bits. When that didn’t pan out, I let a bunch of time go by before starting my new show, the Hawk Talk Podcast, where I’m not only the host, but am also the producer. While the production side still isn’t my favorite, I’m happy to report that the process isn’t nearly as painful as I was expecting. Which is a great relief. I don’t know if it’s because I waited two years and tools have improved greatly. Whatever the reason, I’m thankful! Grab a drink and sit back, this is a long post. I have explained this so many times at a local meetup, but it is worth repeating here. I don’t care where you are at with your knowledge on a subject, you are ahead of other people and those other people are looking for answers that you have in your brain. I am still really new at producing a podcast. The process below is what I’m using today. By no means do I think it’s perfect. And, if you have suggestions that you think would help me (or my readers) to make things easier/better, I urge you to leave a comment! All good? OK, let’s dive in! The hardware and software I use is MOSTLY universal. 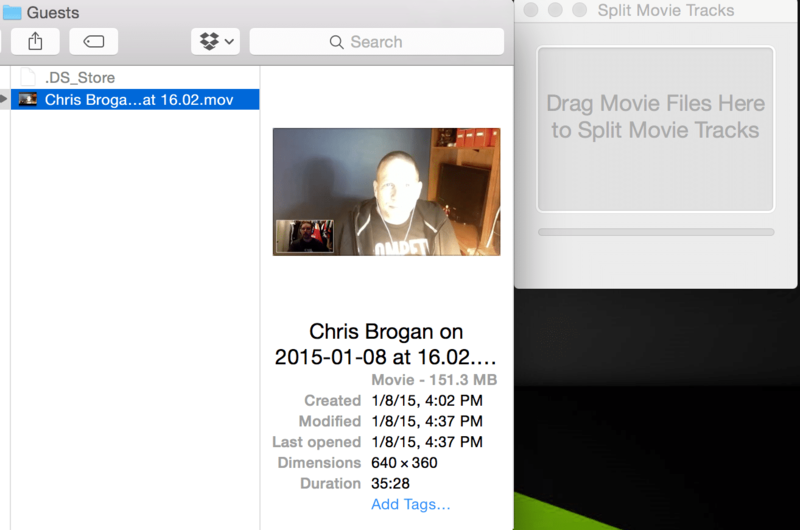 However, I do use a Mac and one of the key pieces of software I use to record the podcast appears to be Mac only. While I would normally provide a link to a Windows alternative, I simply don’t know of one. 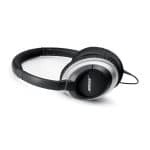 Headphones – I use the Bose AE2 Around-Ear headphones. These are light-weight headphones that I can wear for several hours at a time without them getting uncomfortable. They sound amazing, too. I use them for listening to music mostly, but they work great for podcasting as well. Microphone – I have used the Snowball mic in the past and really liked the sound it produced. Sadly, I dropped and broke it. 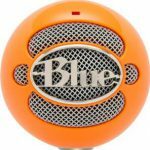 When I saw the Neon Orange Snowball mic, I new I found my replacement. I just got it and started using it for episode #3. The first two episodes where recorded using the Logitech ClearChat headset. This is actually a great headset that I use daily for work. But, not as comfortable as the AE2s when wearing them for longer periods of time. Skype + Call Recorder – Probably the best $30 I’ve spent so far was for Call Recorder for Skype from ecamm.com. It makes it dead simple to record the conversations. Plus, it comes with two add-on tools for splitting the tracks that have made all the difference in the world in making the process easy. 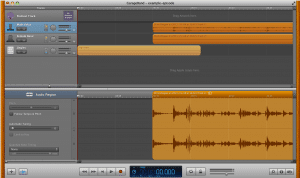 GarageBand – Once I have the call recorded, I hop in to GarageBand to do some editing. 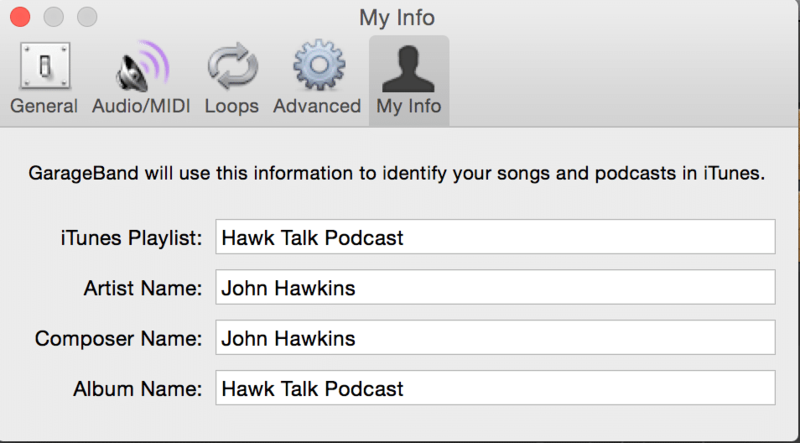 iTunes – I use iTunes to modify the ID3 tags and to ensure the listing will display properly if somebody downloads the track. Since this post is talking about producing the show, I should give you a little insight in to two very important Google Docs I use. The first is the Recording Schedule. 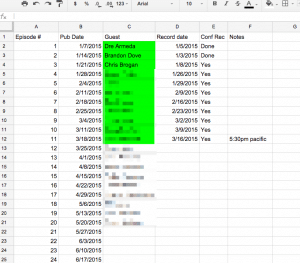 In it you’ll see I list the episode number, the date it’s to be published, the guest, the date we’re scheduled to record, confirmed recording date (yes\no) and a notes column. 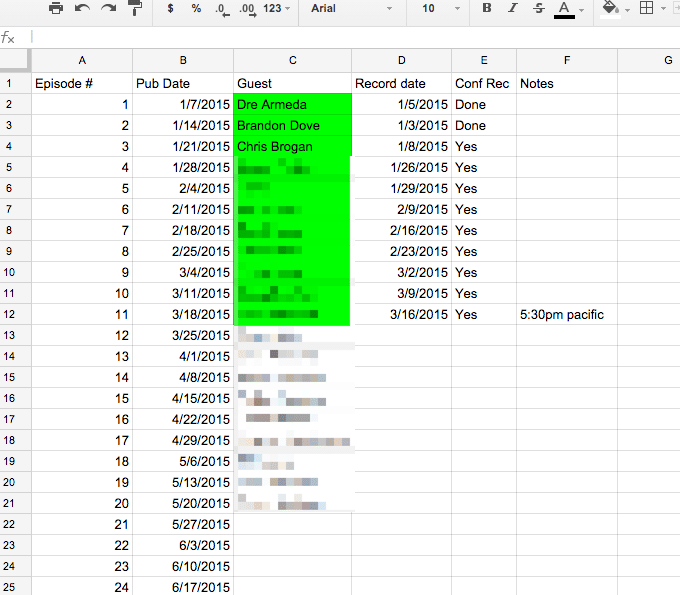 I highlight a guest’s name in Green once I’ve confirmed them for that episode. Once we settle on a date for the recording I send out a calendar invite. Once they accept the invite, I switch the Conf Rec column to Yes. I follow up with them a week before their recording date to confirm that we’re still OK to record. The guests who haven’t been marked in green have already agreed to be on the show, but we haven’t confirmed their dates yet. The second document is a template called Guest. Once I confirm a guest’s date, I will duplicate the template and rename the document ‘HTP-guest-name’. I then typically add a few suggested topics and then share the document with them so they can add items as well. 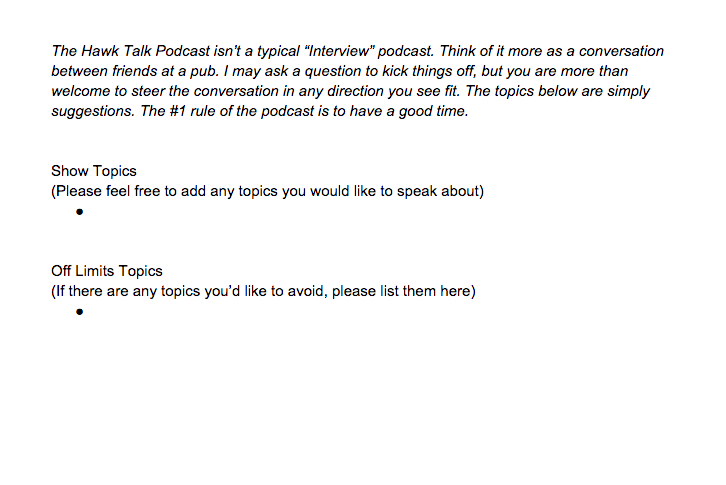 I also include an area where the guest can list topics that they would rather not speak about. Having these two documents at the ready has been a huge help! I feel like the more prepared I am with this type of information, the less stress will creep in to doing the podcast allowing it to remain a fun project. OK, we got our guest, the day to record the episode arrives. Here comes my favorite part! Hitting record! You are probably already familiar with how Skype works. I start up the call with the guest by clicking the big green Call button in the top right. Even though my podcast is audio only, I prefer to record while on a video call. This allows me and the guest to get visual cues for when somebody wants to jump in on a topic, and, I generally find it has more of a personal feel. When we first get on the call, I’ll spend a few minutes explaining how the podcast will work, we look at the google doc one more time to figure out where we want to start our chat. Here is where the Call Recorder software comes in to play. 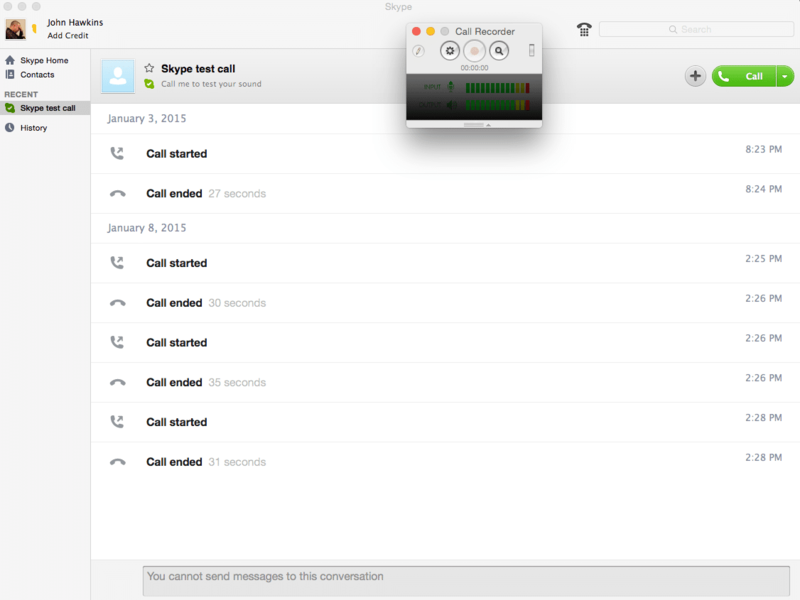 You can see in the screenshot there is a new window called Call Recorder. When I'm ready to begin the show, I click the Record button and we’re off and running. My original goal was to have each episode of the podcast be 42 minutes in length because I’m a serious geek. But, I’m finding that’s not as easy as I would have expected. The first two episodes went over, the third went under. So now, I’m going to try to keep them somewhere around 30 minutes. We’ll see how that goes. When the time is up, I click the Record button again to stop the recording. I then thank my guest profusely and get them off the call as quickly as possible as to not take up more of their time than I absolutely need to. A ‘bumper’ is a short clip that runs during your podcast. Typically at the beginning and end, but you could also have bumpers to break up different sections of your show. Currently, I just use a clip at the beginning and again at the end. I purchased the audio clip several years ago from a website that is no longer around. If you are looking for a custom bumper, you may want to check out audiobag.com. Since the audio clip I was using was over a minute long, I started by using GarageBand to create an intro and outro MP3 file. The intro starts off with music playing full volume for 10 seconds, then starts to fade out over the course of 5 seconds. The outro is the opposite. Fades up from silent for 5 seconds and thes plays full volume for roughly 20 seconds. I have both of those clips saved in a folder so I can easily drag and drop them in to Garage Band when they are needed. This saves a bunch of time since I don’t need to mess with the fades each time I edit a show together. I simply drag them on to the timeline, place them at the right point and I’m done. As I mentioned earlier, I record my podcast as a video, but my final product is an audio podcast. This means I need to split the video file that gets recorded in to separate tracks. 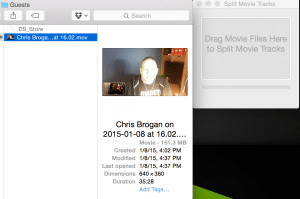 For this I use an app called Split Movie Tracks, which is one of the two add-on tools that come bundled with Call Recorder. I simply drag and drop the .mov file on to the app window and in about a minute I have 3 new files; My audio track, the guest’s audio track and a movie track. With that I now have everything I need to create the MP3 that will become the podcast episode. To mix the podcast, I am using Garage Band 11. I mention the version number because apparently this version is quite a bit different than previous versions. I’m finding that out each time I try to search for an answer on how to do things. 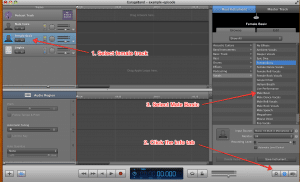 Most tutorials I’ve found talk about menu items and tools that no longer exist in Garage Band. So, if you aren’t using version 11, some of what I say might not work exactly the same for you. 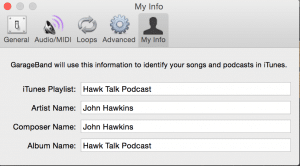 Something that you only have to do one time and it'll save you from having to make a bunch of edits later is to set your default podcast info in Garage Band. Do this by clicking the Garage Band -> Preferences menu item and clicking the My Info tab. You can see how I've set my default info here. When I open Garage Band, I click the New Project link and then select Podcast. It asks me to create a new .band file. Before I save the .band file, I create a new folder specific for this episode inside a main folder for all episodes. I then save the file and up pops the editor. By default you will see a male voice track, a female voice track and a track for jingles. if my guest is a female, I move on. If it’s a male, I select the Female Voice track, click the Info tab on the tool area and select Male Basic from the menu. Next, I drag in my intro file and place it on the jingles track. I then drag in the two audio portions that were created using Split Movie Tracks and place them on the two male voice tracks. It’s important that these stay perfectly lined up or else your conversation is going to sound really weird. To do this, I drag both voice tracks all the way to the left, I select both tracks by holding the shift key and clicking on each track. Once they are both selected, you can slide them along the timeline together. At this point, if I need to do any edits to the recording, I do that here by listening back to the entire podcast. If I find something I want to cut out, I pause the track at the beginning of where I want to cut. I then select both audio tracks and click CTRL+T. I then listen forward to the end point of what I want to cut and hit pause again. I then select the chunks on the timeline that I want to remove and from the menu I choose Edit -> Delete. I then need to select the two audio tracks and move them to the left to replace the missing section of audio. That may sound harder than it really is. In actuality, it’s pretty simple. While I'm listening back to the podcast looking for edits, I take that opportunity to write down notes about the show that will be used for the Show Notes portion of the blog post I'll write for each episode. On a couple occasions, the recording has come out with a bit of an echo. 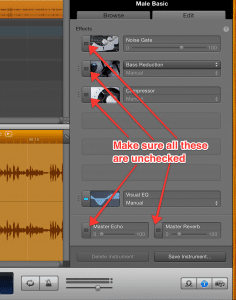 Removing that in Garage Band has proven to be pretty easy. I select the track that has the echo, and on the info tab I click the Edit tab. This shows a number of effects that you can easily turn on/off. I turn off all the items other than the Visual EQ. Honestly, I’d turn that off, too, but I haven’t noticed a difference in the audio when it’s on or off so I typically don’t bother with it one way or the other. At this point, we’re done editing the audio track. From the Share menu I choose Export Podcast to Disk. This will pop open a dialog box where you set a couple items. 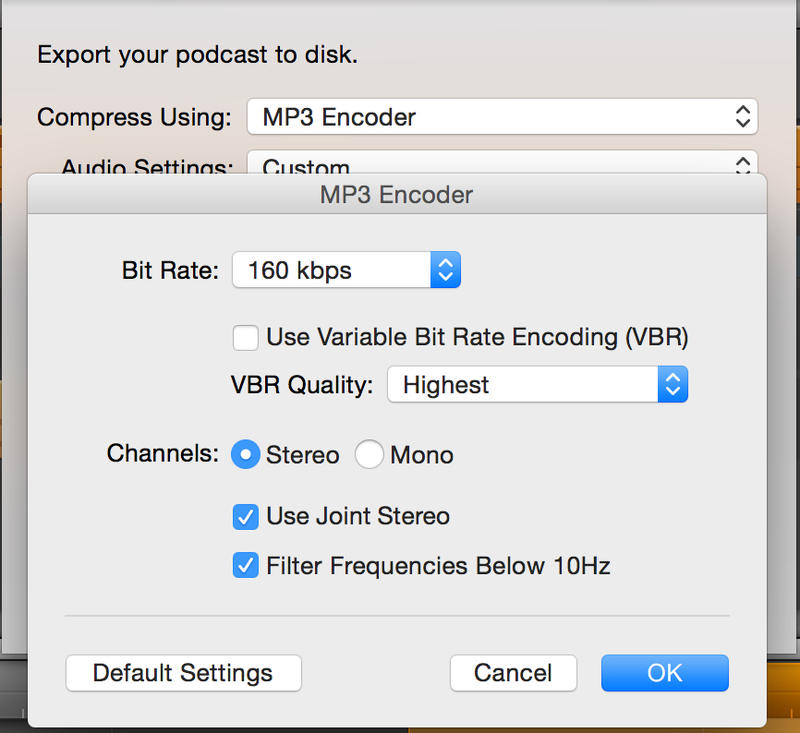 Compress Using is set to MP3 Encoder and Audio Settings are set to custom. You can see the custom settings in the screenshot to the left. I then click the Export button and this will save the file to your hard drive as an MP3 file. Once the file is mixed down, from an audio standpoint, we’re done. But, there’s one last bit we need to update; meta data. The reason we want to edit the meta data is for those listeners who download the track from the website and listen to it in iTunes. 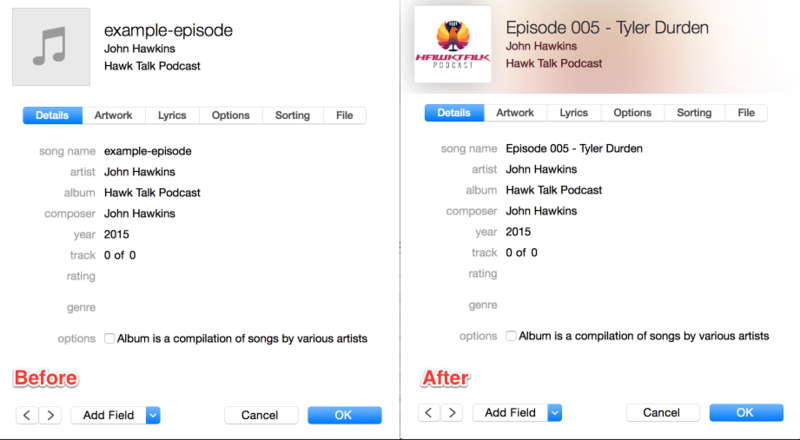 If you don’t edit the meta data, it’s going to look funky inside of iTunes. To edit the file, double click the MP3 which should open the file in iTunes. Then, right-click on the file and choose Get Info. First, on the Details tab, this is where I set the general information about the specific episode. To the left you can see the settings I use. I then switch to the Artwork tab where I drag and drop the podcast logo that I have saved as a 2048×2048 PNG image. Why iTunes wants the image so large is beyond me. But it’s what they ask for, so I give it. You may also notice all the pre-filled data on the left that I don't have to edit each time because I set up the default info in Garage Band. Very handy. 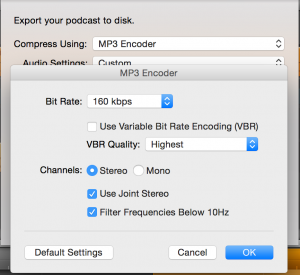 An episode of a podcast is nothing more than an MP3 file. But MP3 files can get big. Depending on your website host, you may not want to host them on your own server as the files can take up considerable space, and, if your show gets popular, the amount of bandwidth used to deliver your show to your listeners could get expensive. I use a service called blubrry.com which costs me $20/month. There are other services out there and you may be able to save some money going a different route. 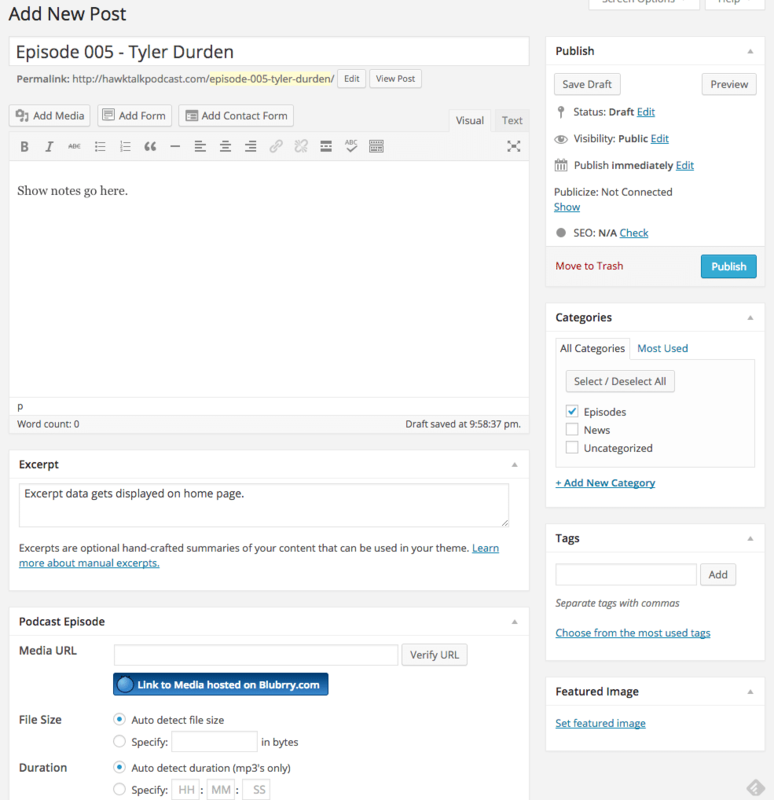 I choose to use Blubrry because it integrates with their WordPress plugin that I use and allows me to upload the file to their service directly from my blog post editor. This makes it very simple to deal with the files, and for me, that simplicity is worth the cost. 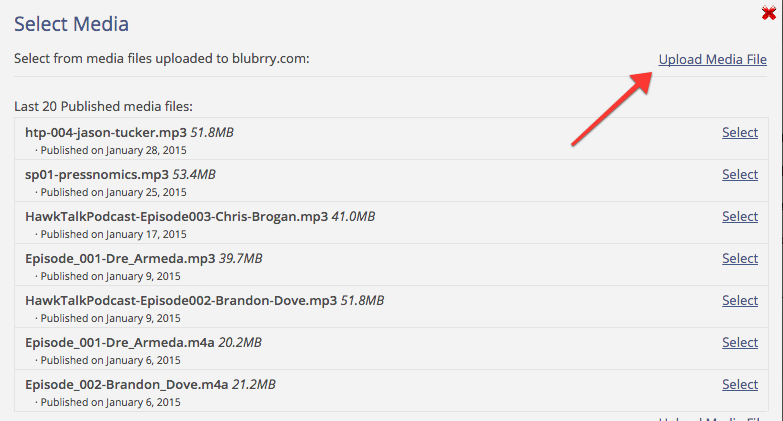 Blubrry also offers stats to show how many times your episode has been listened to, which adds to the value for me. My podcast's website, hawktalkpodcast.com, is built with WordPress and I use a plugin called PowerPress that makes the posting the episode extremely easy. Aside from making it easy to post episodes to my website, PowerPress helps with the process of preparing your podcast to be submitted to iTunes. The settings page looks a little daunting at first, but once you get all the bits of data that iTunes wants, the PowerPress settings themselves are pretty straight forward. And after you submit your podcast to iTunes and get accepted, as you post new episodes of your show to your site, they will automatically be pushed to iTunes. 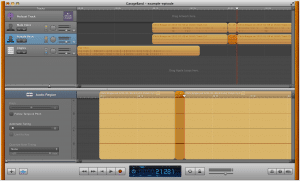 To post a new episode of the podcast, it starts the same way as creating a new blog post. Posts -> Add New. I fill in the title of the episode as the title of the post and in the description area where the main blog content would be, this is where I add all the show notes. 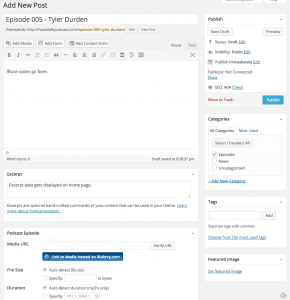 I use the excerpt section to write the content that I want to show up on the home page of the site which acts as the show’s archive. I add each episode to a category called Episodes. I did this so that I could potentially write other posts on the site if there is upcoming news that I want to share with readers. When I submitted my podcast to iTunes, I submitted the feed URL from the episodes category, so anything not in that category doesn’t get sent to iTunes. As a side note, the PowerPress plugin will suggest and provide that URL to you on the settings page when you are preparing to submit your show to iTunes. 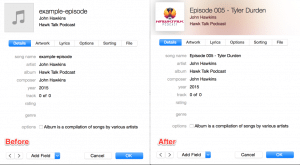 Under the main content area there is a new section called Podcast Episode. To upload your episode to Blubrry, click the Link to Media hosted on Blubrry.com link. This will show you a pop-up where you can select a previously uploaded audio file, or you can click Upload Media File to upload a new one. Once you upload your new file, the pop-up will close. Click the Verify URL button and that should auto-fill the File Size and Duration boxes for you. Because of the theme I use, I also add an image to the Featured Image section. Depending on your theme, you may not even need to do that step. The final step for me is to schedule the post. I typically record my episodes on Monday evening, I then produce them on Tuesday and release them each week on Wednesday morning at 9am Pacific. In the Publish box, I click the Edit link and set the date and time for the episode’s release. Click OK and then click the Schedule button and I’m all set. Next I’ll be focusing on building up my listenership. I already post links to Twitter and Facebook and I’m also using Instagram to post some pics of guests. I’ve still got a lot to learn on that side of the process and will be doing a bunch of experimenting along the way. I don’t know if I’m going to try to monetize the show or not, so things like sponsorships are still up in the air. If you’ve got any suggestions, please leave a note in the comment section. So that’s it. It sounds like a lot, but now that I’ve done it a handful of times, I’m getting pretty quick at it. Thankfully, I didn’t have to figure all this stuff out on my own. Jason Tucker from WPMedia.Pro was a HUGE help getting me started. He has great information on his site and was kind enough to answer dozens of questions for me along the way as I was getting things set up. Thank you, Jason. You were a tremendous help! Jason was also the guest on episode 4 of the Hawk Talk Podcast. 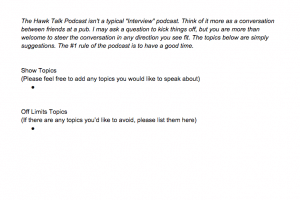 He gave out some excellent tips for people getting started with a podcast. You should definitely give it a listen. When I started out, I was using a very similar process. For the last year or so I switched to Live Hangouts so I could send to my Pro group (they get to watch the stream first) and then pulled down the recorded video for later publishing. I would then split the audio/video much like you and upload both. This year, I’m going back to mostly audio, because I want a higher grade of audio that Hangouts is currently lacking. Keep up the good work, you’re one of the good ones. The idea of giving content to members sooner is something that has come up several times. Have been considering writing a plugin that would keep selected posts out of the RSS feed for a number of days so that you could deliver behind the scenes to members today and then iTunes and non-members get it later. In my spare time, I guess. Great post! I finally got around to reading it as I’m getting ready to start production on my upcoming podcast for the new year. You likely have a pretty tech savvy interview list, so not sure you would have to do this, but is there or do you also send your interviewees a list of things they should do on their end in order to capture the clearest audio? I was thinking about this just the other day, so your timing is pretty funny. We, as podcast producers, spend so much time worrying about our own equipment and the environment in which we record, but the person we’re interviewing could be calling in from the middle of a construction zone. Putting together a quick pre-interview “best results” email to send to your interviewee that talks about how they can help produce the best audio would be a really great idea. It’s not something I did, but will definitely consider when I pick back up. Can’t wait to hear your podcast!